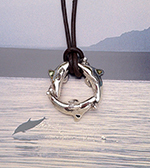 These handcrafted dolphin jewellery designs are inspired by dolphins seen this summer, playing and feeding in the currents at local beaches, here in Wales. Breaking the surface of the water their bodies glistening in the sunshine these wonderful marine mammals are regular visitors to our waters in the summer months. 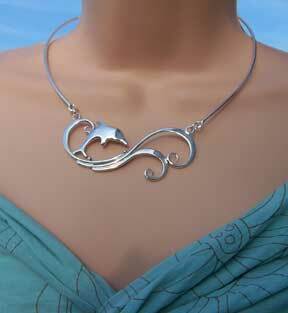 This highly polished silver dolphin necklace is a magical piece. 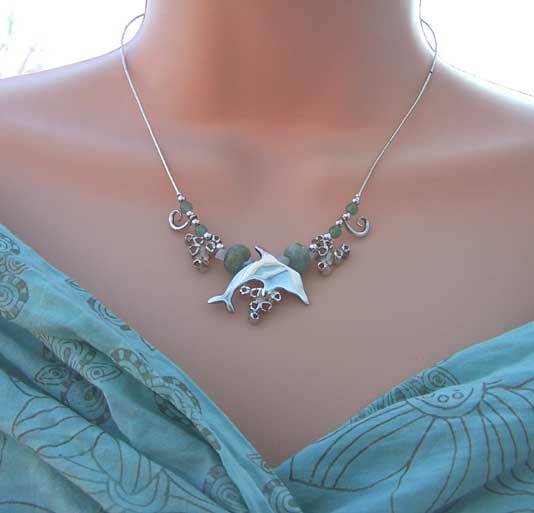 The light dances off the surface of the dolphins back as it glides through the silver barnacles, silver curling waves, ice-blue aquamarine and cool turquoise beads. 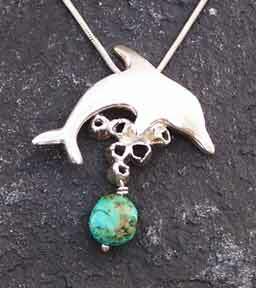 Silver dolphin with barnacles and turquoise drop on a 16 or 18 inch chain. 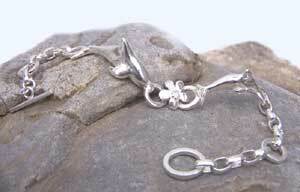 Solid silver dolphin 1mm thick with a wild flower on silver chain. 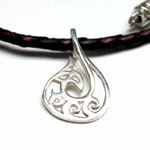 Copyright © Pa-pa Designs Ltd 2003-2014 Designs registered with the UK Intellectual Property Office, Newport. I was fortunate in 2007 to swim with a wild dolphin on the West Coast of Ireland at a remote stretch of coastline. Myself and my husband were overwhelmed by the playfulness of this beautiful dolphinl. 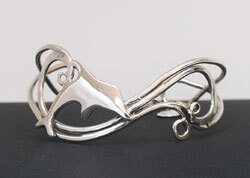 At one point the female dolphin finned down to the sand below and lifted a piece of plastic waste from the ocean floor and presented it to me one the end of her beak not more than twelve inches from my mask. With tears in my eyes I realized I had witnessed something truly ashtonishing.